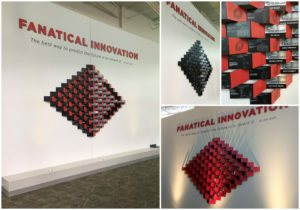 This month’s Design Contest winner, Cold Fire Signs, truly has created a unique modular design for Rackspace’s headquarters in San Antonio. It was created to highlight the company’s many patents and innovation awards. The design is modular so it can be easily added to in the future. The installation consists of dimensional letters, cut vinyl, and custom bent PVC panels. From directly in front you can see both sides of the bent panels, but as you approach from the right of the installation all panels look red, and when approaching from the left all panels appear to be black or silver. This design won them a 50 inch TV and the winner’s badge that they can display on their social media sites, web page or anywhere else they wish to brag! Make sure you congratulate them on Facebook and check out their website too! Want to learn more about our monthly #VOXcontest? Check out our design contest information page for the guidelines and rules.